APAS is the most advanced computer-based system for the measurement, analysis, and presentation of movement performance. The study of the motion of living things is known as "Biomechanics" and it has evolved from a fusion of the classic disciplines of anatomy, physiology, physics, and engineering. Biomechanical quantification are based on Newtonian equations and the APAS analytic technique models the human body as a mechanical system of moving segments upon which muscular, gravitational, inertial, and reaction forces are applied. Although the system has primarily been used for quantification of human activities, it has had some industrial, non-human applications. 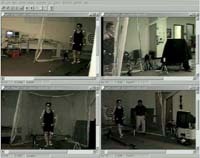 The computerized hardware/software technique provides a means to objectively quantify the dynamic components of movement and replaces mere observation and supposition. 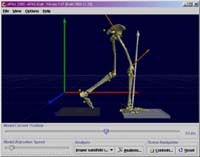 Ariel Dynamics Inc. invented the first computerized Movement Analysis System, known as the Ariel Performance Analysis System (APAS) in 1968. The System's inventor, Dr. Gideon Ariel, developed the first online electronic digitizing system for reducing each picture in a film sequence, and later from a video, into its kinematic components. Since 1971, the Ariel Performance Analysis System has assisted medical professionals, sport scientists, and athletes to understand and analyze movement using its advanced video and computer motion measurement technology. It surpasses all other video systems for quantitative accuracy and scientific excellence for the most cost effective choice in major medical and research institutions around the world. 3Dkin is a program for calculation of human lower extremity kinematics and kinetics in 3D. The convention is based on a anatomical coordinate system providing information on joint flexion/extension, abduction/adduction and also internal/external rotation. The mathematical model for the kinetic calculations is based on inverse dynamics using a free body diagram. 3Dkin program introduces a new approach for calculating joint center. Estimating 3D kinetics of the lower extremity the joint center of the ankle, knee and the hip must be obtained. The previous approach has been the use of anthropometric data which covers relative location of the joint center with respect to an arbitrary coordinate system created using three well defined/positioned markers. In order to compensate for individual variation in joint structure the joint centers are digitized for the first few frames of the sequence of interest. 3DKin calculates the actual parameters for estimating the joint centers for the individual in question. This approach will also cover for some of the variation in the position of the markers. The Analog module is used as a general purpose laboratory data measurement and analysis sub-system. The module is designed to sample, save and present analog signals from many independent channels. A fast measurement rate is possible, with high resolution and programmable input voltage ranges. Data signals are measured to a 12 bit (1 in 4096) resolution. A number of triggering options are provided to assist in the capture of transient data and to allow the synchronization of the analog module with external events. The analog module also includes a set of specialized EMG signal processing options. EMG data samples can be analyzed using a number of sophisticated techniques including spike analysis, signal rectification and integration, envelope processing and spectral analysis. The first analytic step after recording is transferring the video image into the computer hard disk for digitizing. The Capture module is a Windows based program for capturing and storing these images for analysis using the Ariel Performance Analysis System (APAS). The Capture program is designed for capturing analog video and requires the analog frame grabbing hardware. This module does not support using the Digital Video (DV) capture hardware, for which a separate module is available. Digitizing is the first step for analysis after the recorded images have been captured and stored on the hard disk of the computer. The Digitize module is a Windows based program for digitizing images to be analyzed using the Ariel Performance Analysis System (APAS). Digitizing can be performed in one of two modes, either Manual or Automatic. Manual digitizing is performed under computer control and the digitizing of video images is computer assisted. A trained operator with a reasonable knowledge of anatomy and a consistent pattern of digitizing can rapidly produce high-quality digitized images. Automatic digitizing requires some sort of visible markers. User input is minimal as the computer automatically tracks the markers based on color, contrast, position, velocity and acceleration. Once an analysis sequence has been digitized, transformed and smoothed, the Display module can be used to obtain a complete presentation of image motion data for biomechanical analysis. Display allows simultaneous presentation of the three-dimensional stick figures, displacement, velocity, acceleration, video images and numerical data tables as well as analog data signals. The stick figures may be displayed in single frame, multiple frames or animation mode with multiple image sequences being viewed at the same time. The size, location and orientation of the stick figures for each sequence can be set in any manner desired to create comparison displays. Text labels can be added to the display to create complete illustrations and copies of the color graphic display may be printed from the color printer. The software also allows normalizing the data signals in both time and amplitude. One of the most intriguing and challenging areas of study in biomechanics is probably the muscle itself. The electrical signal associated with the contraction of a muscle is called an electromyogram or, by its shorthand name, EMG. Electromyography is the study of muscle activity by measuring these electrical signals. Clinicians and researchers have applied the study of EMG to the fields of neurology, surgical assessments, functional capacity evaluations, ergonomics and overuse injuries, and chronic pain evaluations, just to name a few. In addition to the extensive EMG analysis options found in the Analog module of the Ariel Performance Analysis System (APAS), the Ariel EMG program provides additional capabilities. The EMG module is a Windows based program for calculating the integral and normalizing the EMG signal in both time and amplitude. An understanding of the electrophysiology and the technology of recording is recommended for optimal use of the EMG program. Filter is used to remove small random digitizing errors or "noise" from the transformed image sequence. The digitizing process involves measuring the location of each body joint. As with any type of measurement, there is no correct value, only an estimate to some known level of accuracy. Therefore, each measurement consists of two parts: the actual or true value, plus an error value due to the inability to perform exact measurements. This module will improve digitized joint locations by minimizing the effect of the errors made during the analysis process. In addition to the displacement curves, it can display velocity and acceleration curves for each component. By viewing the acceleration curves, the extent of random error remaining in the data can more easily be determined. APAS/Gait is an add-on module to the APAS System. It allows full-fledged gait analyses using industry-standard marker sets. It will generate standard charts and standard analysis reports with a click of a button. APAS/Gait uses 3-dimensional rendering of the kinematic data in real-time. This allows you to visually validate anything you are doing. If you inadvertently input a wrong anthropometric measure, or if your data contains errors of any kind, you will be able to spot this immediately in the 3D display. APAS 3D Renderer is an add-on module to the APAS System that lets you render 3-dimensional kinematic data in real-time. 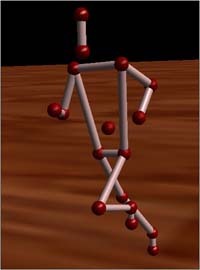 We strongly believe this module is a valuable addition to standard "stick figure" displays because rendered 3D models can convey more information about segment orientations than stick figures. Although rendering 3D kinematic data is generally a task that is not easily undertaken by many of us, we strongly believe we have succeeded in creating a product that is easy to use and gives impressive and smooth rendering results on inexpensive hardware. The computation phase of analysis is performed after all camera views have been digitized. The purpose of this phase is to compute the three-dimensional image space coordinates of the subject's body joints from the relative two-dimensional digitized coordinates of each camera's view. The Transform module is a Windows based program for performing this conversion process. Transformation is the process of converting two or more, two-dimensional digitized views into a three-dimensional image sequence. The transformation option is also available to convert a single, two-dimensional digitized view into a two-dimensional image sequence. In either case, the process involves transforming the relative digitized coordinates of each point in each frame to absolute image space coordinates. This process is performed entirely by the computer. Some initial timing information will be requested, after which the transformation will occur automatically. When video images are captured directly from the camera to the hard disk drive on the computer, it is common to capture more images than are required for the desired analysis. The Trim module is a Windows based program that provides the ability to edit several video sequences simultaneously. The video editing phase of analysis is performed after all camera views have been captured to the computer but prior to being digitized. The purpose of this phase is to clip the stored AVI file from each camera view based on the synchronizing event. Trimming is the process of ï¿½cutting-outï¿½ a series of images in the captured video file into a more manageable segment that can be used for analysis. One of the most common forces acting on the body is the ground reaction force, which acts on the foot during standing, walking or running. This force vector is three dimensional, consisting of two shear components (X and Y) acting parallel to the ground plus a vertical supporting force (Z). These forces can be measured using a multi-component force transducer. This transducer is commonly know as a force platform. The force platform also provides the location of the center of pressure of this ground reaction vector using the relative vertical forces seen at each of the transducers. It is often valuable to combine the ground reaction force with the video data. The Vectors module is a Windows based program for superimposing the 3-dimensional ground reaction force vector onto an AVI video image using the Ariel Performance Analysis System (APAS). Specialized laboratories study these vectors with the goal of improving sports performance, evaluating injuries or the effects of disease. The Vectors module provides the clinician with the tool to observe any deviations between normal leg and foot alignments with the resultant force vector.